Certification of the product refers to its suitability for area measurement as described in the JRC document JRC IPSC/G03/P/SKA/asi D(2007)(8307). Depending on the accuracy (buffer size) the product is assigned to one of 4 categories. The certification mark is awarded within the framework of voluntary testing and certification. 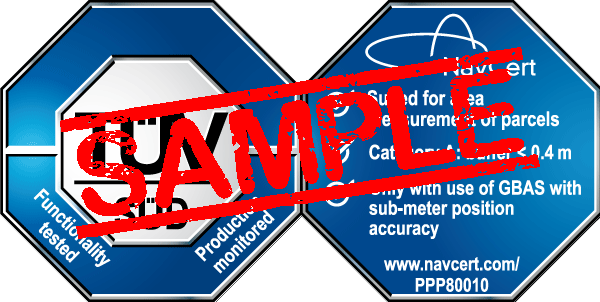 It is based on EU Directive 927/2007 for which NavCert has been accredited by the EU. Within the framework of EU Directive 927/2007, only equipment in Cat A through to C may be used for area calculation. Production facilities are inspected annually to verify the implementation of the prescribed quality management procedures and the compliance with all requirements of the underlying standards. Verification that the equipment offers sufficient accuracy (authenticity and precision) for the measurement of agricultural parcels. In this context, the equipment was also checked to verify if the user interface and the available documentation enable an experienced user to perform measurement correctly.